The former church complex Convento delle Cappuccinelle, situated in a very dense neighborhood of Naples historical center, was a juvenile jail until the end of the last century when it was definitively dismissed. On 2015 a local grass-roots group (“Scacco Matto” / Check-mate) occupied it, aiming to find a social purpose for the empty complex. 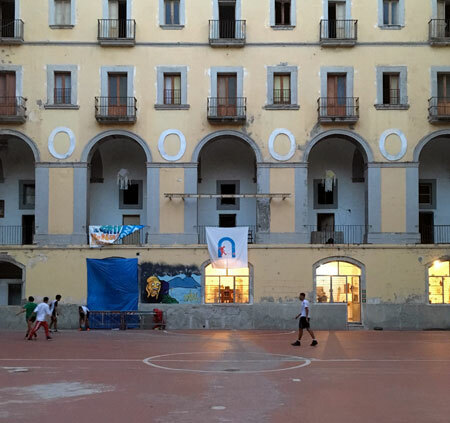 The building, re-named “Scugnizzo liberato” (Freed street child) was partly self-restored by the occupants and now is hosting mutual activities (such as language courses, after-school, sports, dance, and theatre) and spaces for coworking, art and craft labs. Naples municipal government, the current owner of the complex, decided to support the occupant group and recognized – with a public resolution – the social value of the activities run in the complex, giving to the occupants the possibility to stay and to run the structure through self-management.